The Center celebrated its fifth annual No Limits Gala November 1, at the George Watts Hill Alumni Center on the UNC campus. Nearly 150 friends and supporters celebrated the evening with dinner, music, as well as silent and live auctions. John Gilmore, MD, director of the Center, Thad and Alice Eure Professor and vice chair of research in the Department of Psychiatry, welcomed guests. Aaron Nelson, chair of the Center’s Advisory Board, hosted the evening and provided an entertaining live auction. 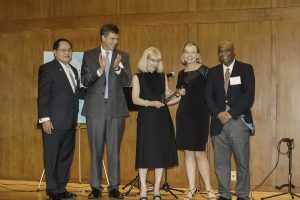 Following the silent auction and dinner, UNC Alumna Joanne McGill-Ackerman received the Center’s Community Mental Health Advocacy Award that is presented annually to an individual who is a community leader and supports the community in improving mental health through education and advocacy. She spoke briefly about her experiences and desire to support individuals with mental illness. McGill-Ackerman has provided significant financial support for the Center’s innovative recovery programs, which are not paid for with traditional clinic revenue. The evening closed with special entertainment by the PopupChorus. “We are grateful for the support of our guests and sponsors for our gala,” said Gilmore. Our 2018 sponsors include: Gold Sponsors Hugh & Lianne MacGregor, Jim & Karen Lamont, Bronze Sponsors Evan & Cheryl Ashkin, David & Carol Callahan, John & Kelly Gilmore, Lee Smith, and SunTrust Bank Participating Sponsors Brynn Marr Hospital, Old Vineyard Behavioral Healthcare; Shared Visions Foundation; and Verla Insko.